I bought the Speck See-thru case for my iPhone 3G from SpeckProducts.com. I wanted a thin clear case that would only cover the back & sides and I would use a screen protector for the front. The Speck cover is exactly what I was looking for. I did think it was a bit steap in price being $29 with $7.95 shipping but I bought it anyway. About I week later I received it & as soon as I took it out of the box I saw small superficial scratches. 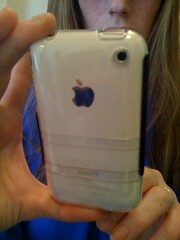 When I put it on my iPhone the scratches were right in the spot the mirror Apple Logo is so they really stuck out. I emailed Speck customer service right away & when I didn't hear back from them after a week I emailed them again. It has been 2 weeks since my 1st email & no word from Speck. I am a very unhappy customer! I would have been happy with an exchange, $38 is a lot of money for a piece of plastic to begin with & then for it to come scratched! I will NEVER buy from them again & would recommended you don't either! Did Speck ever resolve your problem. I had a problem once (i actually damaged it) but they we're cool about getting me a new one. Just wondering.